“We don’t need no stinkin’ Badges! !” Was yelled back at Humphrey Bogart’s character by a Mexican Bandito, in the classic movie The Treasure of the Sierra Madre. But in the Old West during the last part of the 19th century a Ranger, Marshal, Sheriff or Agent Badge was much sought after. With the badge went the job, and if you had the stomach to enforce the law it was a fairly good paying job compared to many on the western frontier. We’ve got a collection of over 40 old west badges that are exact replicas of the very same western badges made famous by the Earp Brothers, Wild Bill Hickok, Pat Garrett and many other lesser known individuals. And now you can have one too. High quality replica badge. Comes in gift box with story card. Badges are $10.95 each plus $9 shipping. Order 2 badges for $21.00 plus $9 shipping. Order 3 badges for $30.00 plus $9 for shipping. Posted shipping charges are for mainland USA. For shipping to other states, Canada and South America, please add the 10 dollar shipping option. Overseas orders add the 20.00 dollar additional shipping option. Thank-you. Questions should be e-mailed to service @ thelastbestwest .com . Badges ship from the US and GENERALLY arrive in 2 weeks or less in mainland USA. If you require express shipping add the extra shipping option :: You will be furnished a tracking # once the badge is on the way if you have ordered faster shipping. It all started with the classic movie from the 1930s – “The Treasure of the Sierra Madre” and then in the 1970s it was spoofed in the Mel Brook’s movie “Blazing Saddles”. Now a days it’s heard regularly on TV Dramas and sitcoms, like the 1990s Friends. High quality replica badge. Comes in gift box with story card. One BADGE for $10.95. :: $9.00 is added for shipping. Available in 3 classic styles: Marshal, Sheriff, and Brothel Inspector. Now you can add that final cowboy flavor to your business, event, or association. 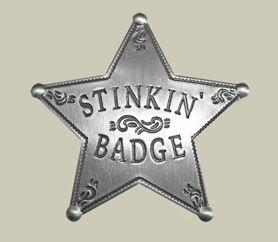 Based on original designs from the Wild West these badges are top notch replicas in weight and look of the originals. More about Custom Western Badges.